From time to time I spot an old patent where I can see what they tried to achieve, yet have to wonder about details in how they tried to achieve it. 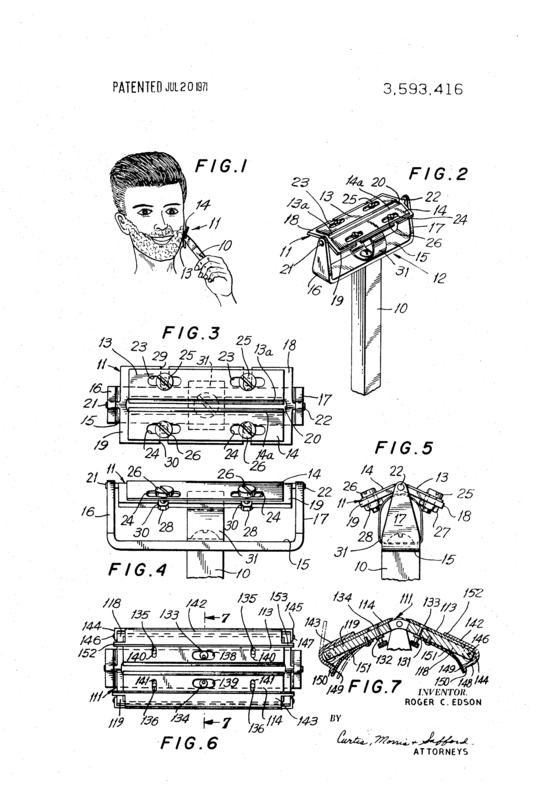 One of those is Roger C Edson's patent from 1968 for a razor with a pivoting head. Today a pivoting head is de rigueur when it comes to cartridge razors, but fifty years ago in the last days of the era of widespread use of DE razors it was significantly less common. Quote: ...a razor having a bifurcated yoke at one end of a handle and on which a blade carrier is pivotally mounted to rock. Quote: The blade carrier has surfaces for replaceably mounting a pair of blades in an opposed inclined relationship with a space between adjacent cutting edges. Each of the blades then acts as a guide for the opposite blade as they are moved in opposite directions and the carrier pivots to follow the contour of the surface being shaved. Ooookay. Two blades, not one. And it gets even stranger when you actually look at the drawings that shows the invention. Have a closer look at figures 1, 2 and 3. Notice anything out of the ordinary? Yes, Mr Eson did opt to use machine screws and nuts to attach the blades to the razor head, would wouldn't glide too smoothly over the skin. Yes, it does look like the blades have a certain amount of sideways play. But what I noticed first is that the cutting edges of the blades both point to the middle of the razor head! Quote: A safety razor comprising a handle, a blade carrier mounted to be freely rockable on the handle, means on said carrier to support and position a plurality of replaceable blades, said blade carrier constructed to mount said blades such that the shaving edges of a pair of said blades face one another and are spaced apart sufficiently for a ridge of skin to be pressed between the edges and further to mount said blades at an angle relative to each other such that when one blade is drawn flatly across the skin acting as a guard and guide for the cutting edge of the other facing blade the latter is positioned so as to produce the proper shaving angle therefor. Needless to say I can't find any evidence that Mr Edison's razor was ever manufactured and sold. If nothing else the use of machine screws and nuts makes changing blades much harder than it ought to be, and that alone would be enough to doom it in the marketplace. Nice find Hans. I imagine some frustration during blade changes with the tiny nuts and bolts.